Gently Rested, Serene and Smoky. Kick back with a smoky yet sweet tequila with a smooth finish and a full flavor. Anaya Reposado delights the senses with a burst of sweetness from the moment you open the bottle, but surprises the tongue with gentle hints of smoke. Fill your glass with slow swirls of liquid gold. Enjoy as the tastes of sweet agave mingle with the slightest hints of fine whiskey to create a sophisticated and memorable flavor. Anaya Reposado remains true to the spirit of pure tequila while adding subtle, surprising twists sure to appeal to passionate devotees. Gentle agave flavor with faint hints of whiskey. Notes of chocolate, hazelnut, and vanilla. Silky texture with sweet scents. Anaya Reposado is one our most popular tequilas, and it’s easy to see why. Rich, yet surprising. Sweet, but never cloying. A refined flavor sensation which refuses to disappoint. Made with agave straight from the Jalisco highlands, carrying the tangy highlights of plants grown in the region’s soil. Gently aged in Tennessee whiskey barrels for eight months for a distinct, full flavor. A complex dance between two regions with rich liquor traditions. 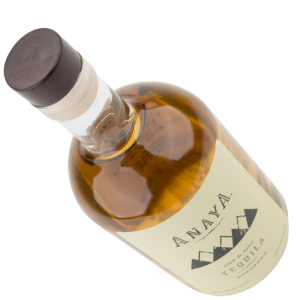 Anaya Reposado makes no compromises; merely pulls the best tastes straight from the barrel before making its way to you. Good for slow drinking and easy enjoyment. Excellent for fruity or signature margaritas. A great tequila for producing daring cocktails. Excellent for diablos or palomas. Anaya Reposado is full of surprises. Sweet to the nose, surprising to the tongue. It’s a glorious blend for those who share an equal appreciation for whiskey and tequila. The flavor highlights enhance the agave base, without masking it or stealing the whole show. Those who like a little contrast in their life. Those who like their tequila smoky, but not too smoky.